Anne Williams performs for the residents of the Washington Home and Hospice in Washington, D.C.
AMSF members regularly perform for residents of the Washington Home and Hospice in Northwest Washington, one of several Community Outreach venues. The above picture shows Anne Williams performing at the Steinway M piano, which AMSF restored for the Home in 1999. "It is satisfying to think that the residents enjoy the modest entertainment we provide. It's a small thank you for contributions made during their active lives and a small gesture that yet others might reciprocate some day." 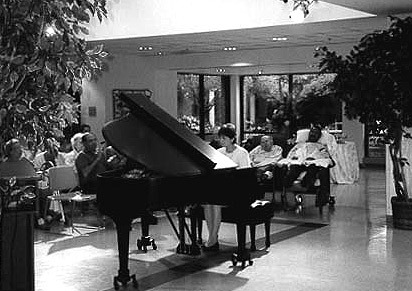 AMSF members regularly perform for veterans at the Comprehensive Nursing and Rehabilitation Center in Washington, D.C., and, in 2007, AMSF donated a piano to that facility. AMSF has extended its outreach to the Martin Luther King Jr Library in D.C. and to libraries in Montgomery County, MD, including Kensington, Rockville, Potomac, Chevy Chase, Bethesda and Praisner in Burtonsville. AMSF also sponsors performances for residents of other facilities in the Washington D.C. region such as the skilled nursing unit of Sibley Hospital. Check the calendar for upcoming performances or contact Donna Kanin, AMSF's coordinator of library/hospital outreach.